We love that we are seeing more interest in antique mourning and sentimental jewelry. These fascinating pieces were treasured by their original owners as tokens of remembrance, and it’s wonderful that they are still being appreciated today. Whole books have been written about this topic, but we’ll do our best to condense the history of mourning jewelry into the space of one blog. Most examples of mourning jewelry were made during the Victorian era. In 1861, Queen Victoria went into mourning after the death of her husband Prince Albert, and remained as such for the rest of her life, some 40 years. This had heavy influence on the fashion of the day, both in England and abroad. Even a more traditional two and a half year mourning period meant that lovely black jewelry was fashioned to match. Georgian Stuart crystal earrings collet set in silver with 14k gold ear wires, at Gray & Davis. However, jewelry made and worn for remembrance and mourning predates Victoria’s sorrow by centuries. Some point to the loyalist jewelry created after the execution of English King Charles I in 1649 as the first “mourning” pieces. Small gold wire symbols were encased in faceted crystal as earrings, rings and pendants. We call these Stuart crystals, named for the reigning family of the time. Rings and brooches were soon made to memorialize not just monarchs, but family members and loved ones. Enamel work and engraving often tell us the sad details about the deceased; many were children. The back of the mourning brooch, which reads "Charlotte Hunt, ob. Jan 7 1791"
Over the generations, this practice evolved; pieces were commissioned not just for mourning, but also to celebrate loved ones. Jewelry with miniature painted faces, sometimes just a twinkling eye, and jewelry of woven hair, occasionally hidden in a locket or ring, began to appear. 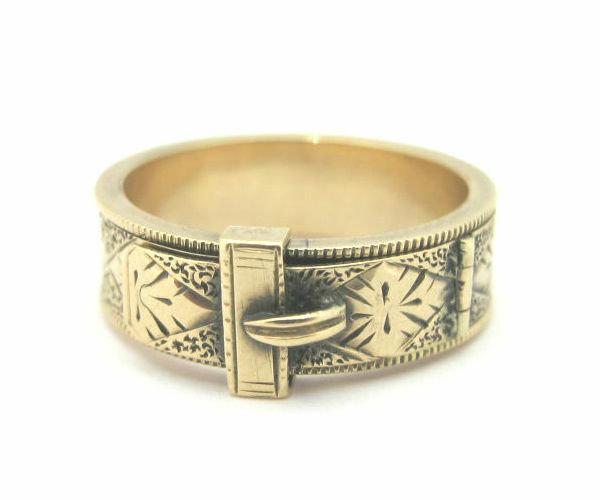 In this vein, sentimental motifs became popular in nineteenth century jewelry design. Knots, heart-shaped locks, buckles and entwined snakes all symbolized endless and unbreakable love. Queen Victoria’s engagement ring from her beloved Albert was a gold snake set with emerald. Victorian 15k gold buckle locket ring, at G&D. It should come as no surprise that we are so excited for two exhibitions now on view. The Costume Institute’s new exhibition, “Death Becomes Her,” at the Metropolitan Museum of Art, on through February 2015, and the Morbid Anatomy Museum’s “The Art of Mourning,” on through January 2015, both show the dress, jewelry and depiction in popular culture of 19th century and early 20th century mourners. We know what we’ll be wearing when we go! Originally known as Decoration Day, Memorial Day was established in 1868, shortly after the Civil War ended. It was a time for the re-united nation to mourn and remember the more than 600,000 people who had perished during the war. Veterans’ graves were decorated with flowers, hymns were sung and public officials made speeches. Even before the staggering losses of the Civil War, Americans were no stranger to death and mourning. Communicable diseases and difficult living conditions meant that early death was very much present in the everyday experience of our ancestors. Out of this harsh reality, the sentimental tradition of mourning jewelry – jewelry that commemorates the dead – was born. Photographs, paintings, poems and locks of hair belonging to the deceased were tucked into brooches, lockets, ring and bracelets to comfort those in mourning after the loss of a loved one. 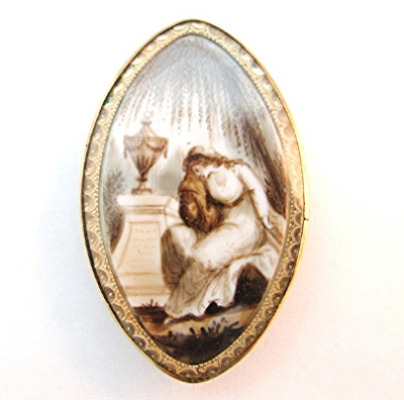 This piece from our collection is a typical mourning brooch of the late 18th century, featuring a miniature scene of a woman weeping graveside, while an inscription on the reverse states “Charlotte Hunt, obt. 1 Jan’y 1791 at 9.” The brooch is of either English or American origin, and is rather understated and elegant. Returning to the 1860s, we see mourning jewelry move away from these subtle personal mementos and become a loud public statement drawing attention to one’s bereavement. In 1861, Queen Victoria’s beloved husband Albert passed away, and for the rest of her life the Queen focused her energy on showing the world how sad she was through fashion. Queen Victoria c.1867, six years after Albert’s death. Even the dog looks sad. Mourning jewels were, of course, a necessary part of these ensembles, and became all the rage with fashionable widows throughout the British Empire. This intricate mourning suite of French Jet is c.1870 and lives in the British Museum. Across the Atlantic, Victoria’s highly stylized grief resonated with the war-weary public, and Americans gladly (sadly?) embraced the English fashion for elaborate mourning. Above is another mourning brooch from our collection: this one is c.1860s, is huge and features a photograph of handsome gentleman. The center of the piece swivels around to reveal locks of hair (presumably belonging to afore mentioned handsome gentleman) and seed pearls in an artfully arranged pattern. This piece is also of American or English origin. Mourning jewelry went out of style around the beginning of the 20th century, as grief became a more private affair. But, as our national day of remembrance approaches, these highly personal tokens of the past serve as tangible reminders of the hopes, struggles and sacrifices of those who came before us.